“I’m blessed because a lot of my friends are trying to figure out their life plan. It makes me feel like I’m doing something right for myself,” said Jomeka Bland, Cohort II. Jomeka not only has a plan, she has a clear vision for her future. And she has plenty of drive and the desire to be a role model for other young women of color. An accomplished Rainier Scholar, Jomeka graduated from Agnes Scott College, with four professional internships on her resume. She seized the opportunity to develop solid, real-world experience in human resources, so she was a strong job candidate as she entered the workforce in 2014. The first steps into her career started with Zulily and Loews Hotel, which then led to an exceptional position in Atlanta: in the HR department of Deloitte & Touche, the largest professional services company in the world. As a role model and leader, Jomeka is giving a valuable gift back to her community. It is a fundamental skill she developed at Rainier Scholars. “I feel accomplished and now I want to help other scholars following in my footsteps,” she said. Jomeka’s parents, Sabrina and Joe Brand were great fans of Rainier Scholars. Through this participation, they ensured that Jomeka’s dreams took flight. Becoming a small business owner has also figured into Jomeka’s career plan. As a Rainier Scholar, she developed self-confidence to aim high and think outside-the-box. She founded Jo’s Resume & Career Services. “I feel like Rainier Scholars is my journey,” she said. But then the journey in her family life took a tragic turn. Her father unexpectedly passed away. Jomeka had lost her steadfast supporter, so proud of his daughter’s college graduation that he had his own Rainier Scholars sweater made to wear to her graduation to honor her accomplishment. Ever resilient, Jomeka found a way to turn personal loss into a meaningful opportunity for another student. 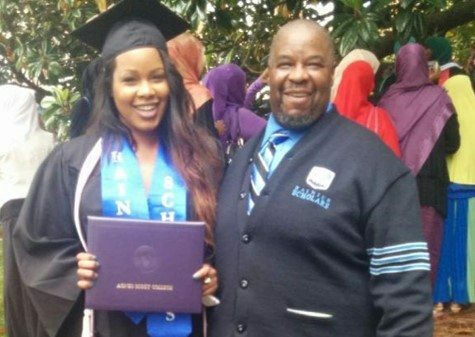 In memory of her father, she established a foundation, Big Joe Fund, that provides a $1,000 scholarship to a graduating Garfield High School senior every year.